I have a quibble with you here. The authors did actually calculate the distance correctly. Crossing off 4pi from both sides(as they both have it), the distance of 100au , does produce a surface area 10’000 times greater. This is rather odd. Even one built out to the background radiation of 2.7 Kelvin, at ~11’500au would only require about 5 earth masses, if made of graphene. (at .77milligrams / meter^2) The marginal increase in efficiency does imply that the energy cost of producing a solar panel has to be below 10MJ per meter squared though though, or that maintenance is 1joule per 10’000 years per meter squared (dividing by the main sequence life time of a sun analog). This decreasing efficiency also applies in the other direction though, with breakeven points of ~15 x 10^15 joules/m2 at 10au , 18 Terrajoules/m2 at 100 au, and 15 Gigajoules/m2 at 1000au. However the author does not appear to mention any of this, or make any effort to calculate it. Your second point is of course spot on. There is no rational reason for choosing a 0.95 Carnot efficiency other than if the authors had chosen a higher value the Dyson spheres would have been undetectable using their approach. If you wanted to add in further constraints you could put in weights to the sails so they weren’t launched outward by the photon pressure of the sun (making them about 1000x heavier) . If using the non stellar mass of the solar system, at 0.14% of the solar systems mass this would limit you to ~3500 au. 1 earth mass is at 155 au , 0.1 at ~50 au, and 0.01 at 16.5 au. Now there is one benefit for one centered around ~1au in that the energy required for heating and cooling the structure would be minimal, if you wanted it at ~290Kelvin. This would for example be a good temperature for human habitable areas. However literally any other required temperature would render this distance irrelevant. I would imagine that any Dyson sphere would be arranged in shells. This would minimise the material required for the outer shell and also the photon pressure on the outer shells. The end result however the sphere(s) (swarm) are built they won’t be detectable to us above the infrared background. Why would efficiency be the paramount parameter? The cost in materials and energy goes as the square of the radius. This implies smaller, hotter Dyson spheres. Only if you are limited to a single sphere. 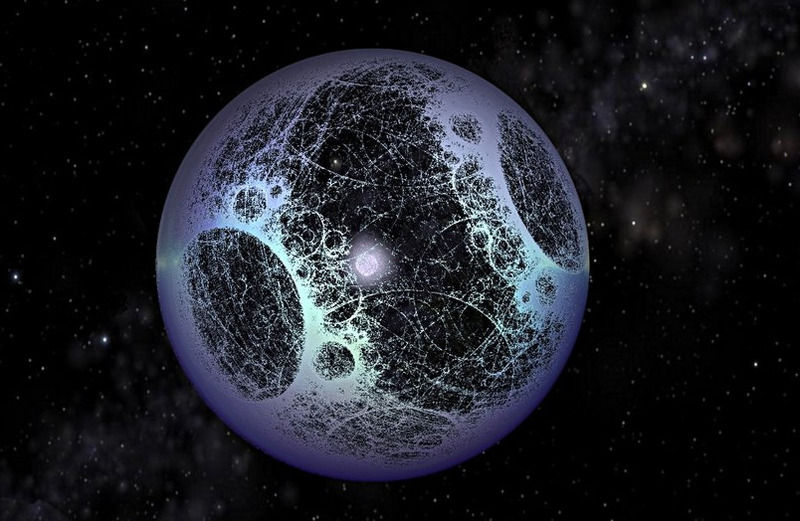 The most material efficient way to build a Dyson sphere would be as a series of nested shells. The longer the wavelength the less material needed to capture the energy. Would you use 10.000 times more material to gain that 5% in efficiency, rather that constructing a 2nd Dyson sphere around another star? Another key point may be: what are the conditions on the inside surface of the Dyson Sphere? What’s his T? Where do we assume the alien civilization is living? What happens to the high grade energy after they use it? It re-radiates as heat. You can’t simply absorb energy without storing it or using it. eitherway, eventually it ends up as heat no matter how efficient you are. The energy gets radiated away a heat. The larger you make the outer shell the more of the energy you capture and the lower the temperature of waste heat. Of course if the waste heat is close to the level of the gas and dust clouds you won’t be able to see it. Because you don’t need to use 10,000 time more material to build the outer shell (swarm). The outer shells job is just to capture the waste heat coming off the inner shell(s) and so does not need to be more than an atom thick (on average). Actually depending on the wavelengths being captured the outer layer could be less than than an atom thick on average as the antennas on the outer swarm don’t need to be continuous. This is something we can only speculate about and would be dependent on what the makers wanted. This is a question beyond my post which is just about if we can detect Dyson spheres in the infrared. OK i am with you and agree with your calculations. What I still don’t understand about this … Let’s say they achieve 99.5% efficiency. Are you suggesting that once they’ve wrung out every bit of work they can muster, then the remaining heat is of such a long wavelength that it blends in to the 4 K background? Even so wouldn’t it show up as a bright spot against the broad background of glowing space dust? BTW/ I like your other posts, especially the one on climate change. I mean putting the cost onto future generations is such a non-PC thing to say. Of course humankind have been doing this in many areas besides climate. I just thought it was a pretty gutsy thing to say out loud. Personally I have no doubt whatsoever that nothing will/can be done to rein in Homo s.’s drive for short-term gain at the expense of our their own future. And I’m known as an optimist in these parts! Within the galaxy there are a lot of sources of higher temperature background – basically all the gas and dust clouds that around 50K. Once the Carnot efficiency of the Dyson sphere gets over 99% then they becomes impossible to detect in amongst all the other 50K objects. Wright et al. argument is a bit like the drunk looking for their keys under the lamp post, not because that is where he dropped them, but because that is where the light is best and then concluding when they couldn’t find the keys that they don’t exist. One final point is that civilisations which store their energy rather then use it, perhaps hoping to overcome landauers principle by waiting for the universe to cool down, or doing Dyson’s eternal intelligence concept. However this also lowers their luminosity. Assuming that it stores energy at the efficiency of a carnot engine, a background temperature energy storing civilisation would be located at ~530 au, and be only 0.2% as luminous as our sun, if it were around a solar analog. This means that the distance we could detect them would be 1/20th of what it would be if they used all energy at the moment it was collected. Or if they were looking for reducing luminosity Sol type dyson swarms, only 90 candidates would exist within the search range.